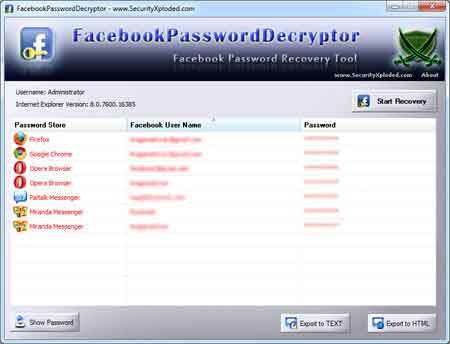 FacebookPasswordDecryptor is the FREE software to instantly recover stored Facebook account passwords stored by popular web browsers and messengers. Most of the applications store the Login passwords to prevent hassale of entering the password everytime by the user. Often these applications use their own proprietary encryption mechanism to store the login passwords including Facebook account passwords. FacebookPasswordDecryptor presents both GUI interface as well as command line version, the later is more helpful for Penetration testers in their work. Apart from normal users who can use it to recover their lost password, it can come in handy for Forensic officials who can get hold of any stored Facebook Login passwords which can give vital clue in their investigation. FacebookPasswordDecryptor is fully Portable software which can be directly run anywhere without installing locally. It also comes with Installer for those who wants to install it locally and use it on regular basis. It works on wide range of platforms starting from Windows XP to latest operating system Windows 7. Qweas is providing links to Facebook Password Decryptor 2.2 as a courtesy, and makes no representations regarding Facebook Password Decryptor or any other applications or any information related thereto. Any questions, complaints or claims regarding this application Facebook Password Decryptor 2.2 must be directed to the appropriate software vendor. You may click the publisher link of Facebook Password Decryptor on the top of this page to get more details about the vendor.